Simon (SeaChamp) : When I was at the metal supplier last week I picked up a length of 3/16" stainless tubing. I clamped it to the workbench and grinded it to 5/32". I took it down to the boatshop today and hooked it up to the Gaggia. It made steam alright. 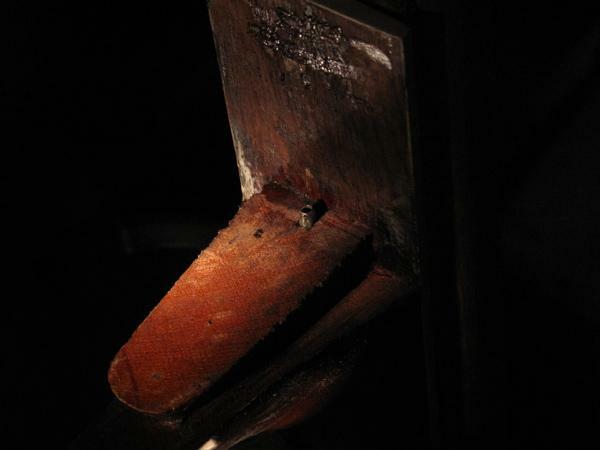 I turned on the steam and let it run for about a minute while I tried to photograph it in the dark of the engine room. 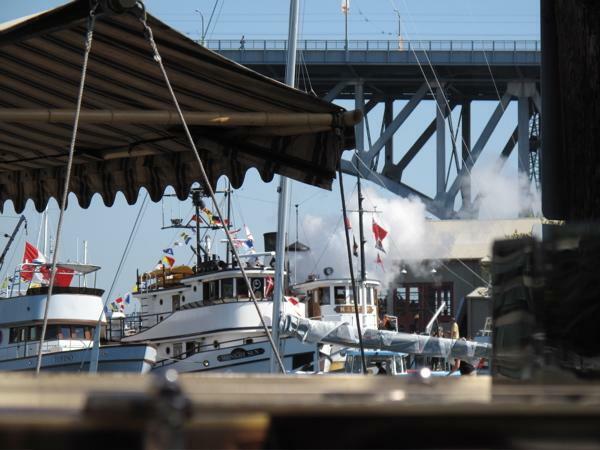 Couldn't do it justice but the steam came roaring out. 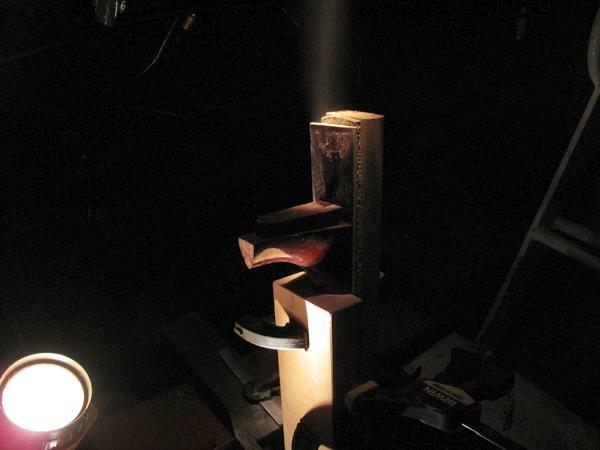 You won't be surprised to hear that the glue at the bottom of the tenon was still brittle...steam never got there. How did they get all that glue in there at that Chicago factory?? k1w1 : Thanks Simon, that's interesting. I figured you would need a tube/hose to get the steam there. But it worked better than I thought it would. Fran�ois : Woooowww... Another excellent report, and this neighboroud... Huge ! Thanks a lot Simon ! fanfab4 : Simon thanks for the demonstration . Your photos again show the whole process well. 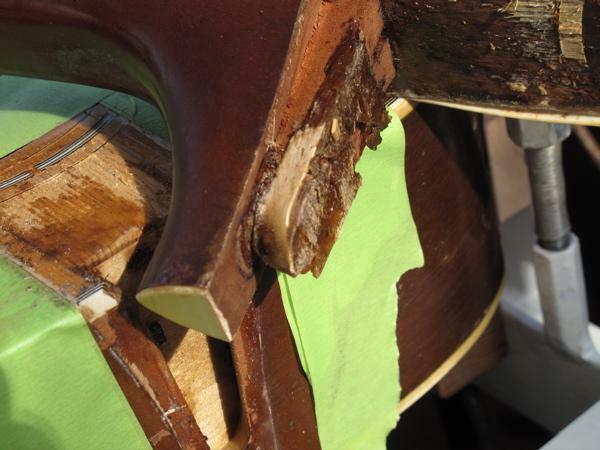 Blue in VT : Yeah thanks that was a very interesting experiment...glad to hear that it didn't do any damage to the guitar...still seems like a fairly clean separation....but if that glue at the bottom of the heel didn't liquefy I can see how you could have pulled a bid piece of wood off the tenon or neck block. 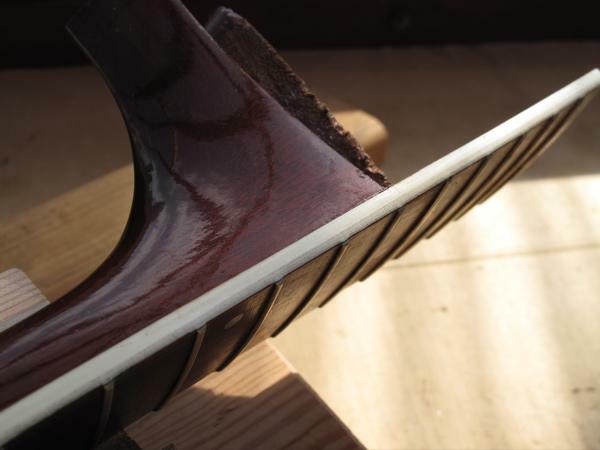 Can you tell me more about your truss rod removal process....or point me to a thread about it ? Thumbpicker : That was great Simon.......Super photos. 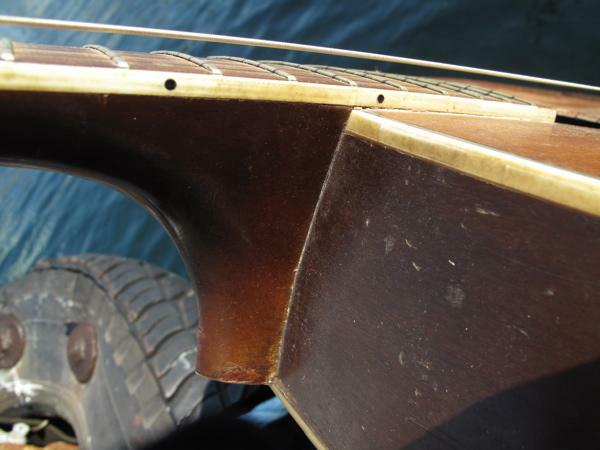 Simon (SeaChamp) : Blue, the best info on Harmony truss rods is in Frank Ford's frets.com. He shows a repair to a Harmony rod. When I followed his thread, I wound up baffled by his ability to cut a piece of brass into hex shape for the nut. Then at the metal supplier I found that you can buy 1/4" hex brass (in ten foot lengths!!) So I took some of my 'extra' brass and drilled and tapped one end (8-32 I'm pretty sure) and that's my 'puller'. 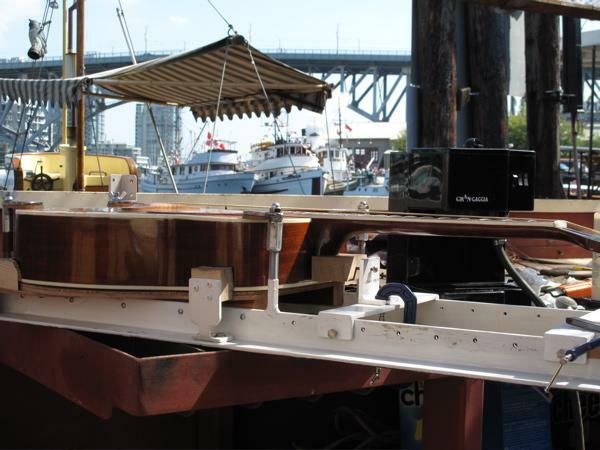 You can see it in the photo, threaded onto the truss rod, with the jaws of the vise grip just visible. So, to go backwards from that picture...first warm up the string nut and tap it off. Remove the truss nut and thread on the 'puller'. 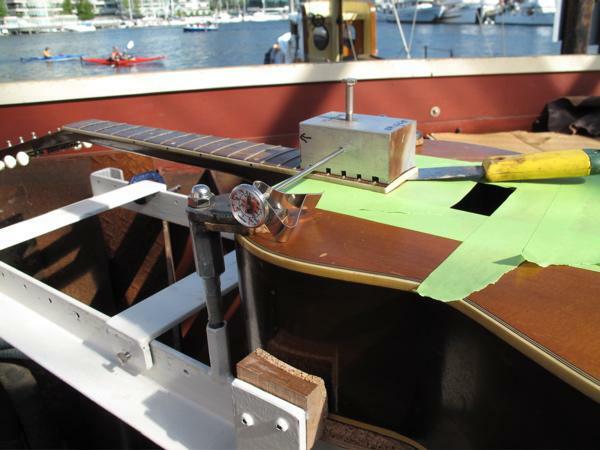 Protect the headstock, clamp on the vise-grips and tap the truss rod out. Some come with just a pull, and the one in the pic needed a couple of taps and came out dirtier than any before. Shoulda seen the glue someone had laid into the string nut. 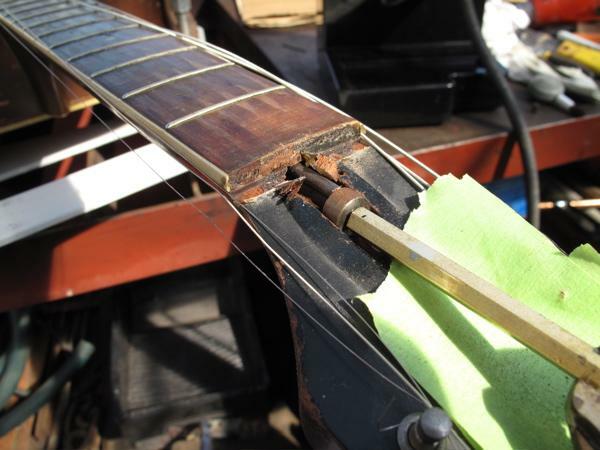 But the splinters it left will all be covered by the truss rod cover. MisterSov : Simon, thanks for documenting another great experiment. 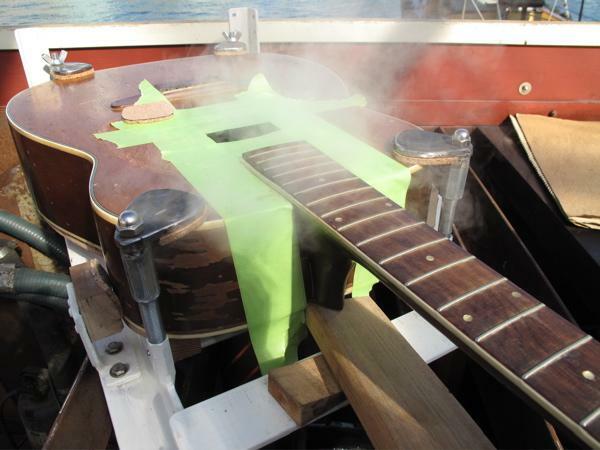 I've never seen steam escaping from underneath the fretboard extension like that. With your tube spraying straight into the neck block, is it possible that it created an upward spray? What about plugging the end of your tube and drilling holes on the sides of your tube (like an inflation needle), or maybe one hole pointing downward toward the tenon. Then you could jam the end of the tube up against the neck block, to assure that your spray hole is in the sweet spot of the neck pocket. 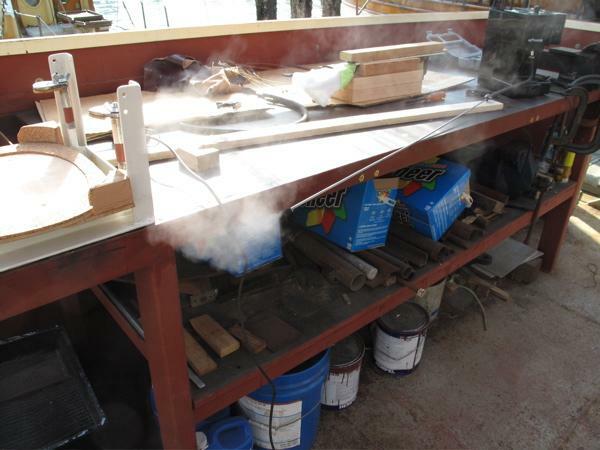 Do you have enough clearance in the truss channel to twist the tube while steaming? 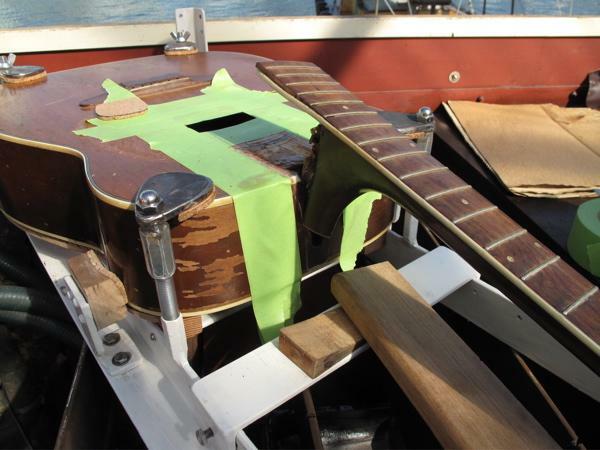 Simon (SeaChamp) : MisterSov, you've neatly underlined the part that makes me nervous about doing this to a guitar I care about...all that steam coming out. It's obvious that's what it's going to do, when you think about it. No steam at all escaped when I steamed off the first neck the traditional way. So all that escaping steam didn't harm the top of the guitar, but the fb tongue wound up a little more curved upwards than the other one, (which remained dead flat...doesn't even need a capo clamp to cuddle the spruce top). 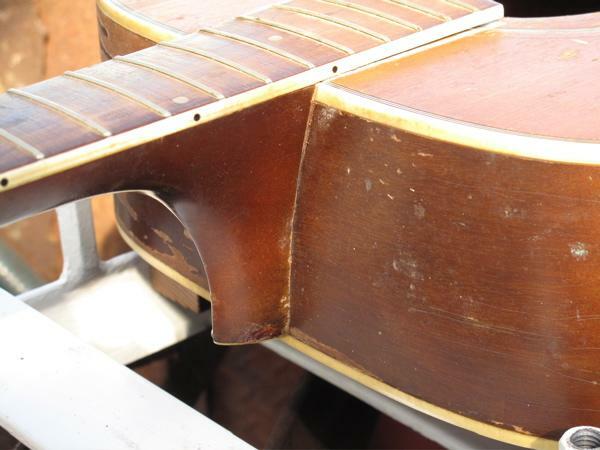 And after it came apart, the glue on the spruce top was soft like a slushy margarita, while the glue in the bottom of the pocket was like margarita on the rocks. It's interesting to me how flexi and floppy the neck becomes as soon as the fb tongue is unglued. I tried to manipulate both necks off before steaming, but no go. Nicole Alosinack told me that she sometimes removes a neck that way, no steam. Your idea of a downward hole is a good one. The way I made my horse needle, it's oval shaped and can't be twisted, so that could guarantee the direction the steam would be forced. I can't immediately think of a way to plug the end of that thin stainless steel tube, though. Maybe a brass tube?? Maybe also the fb tongue could be unglued to a point just short of the tenon...leave a glue dam to prevent the steam from escaping until it melts through the glue.